The following are Tide Tables, showing various river locations and the Tide* at that location depending on water flow. The water in the Colorado River in Grand Canyon National Park is released from Glen Canyon Dam. The Dam lets out more water in the day and less at night, making electricity to sell during the day when prices on the market are just a sliver higher than they are at night. The water traveling through the Canyon does so at different speeds, depending on the amount of water released from the Dam. At flows of 15,000 CFS or less, the 4.0 mph rate should be used. At flows from 15,000 to 20,000 CFS, the 4.5 mph table should be used. Glen Canyon Dam normal operations have higher releases from 7:00 am to 7:00 pm daily. The time reported in the table as Begin High Water is 7:00 AM. Glen Canyon Dam normal operations have lower water releases from 7:00 pm to 7:00 am daily. The time reported in the table as Begin Low Water is 7:00 PM. 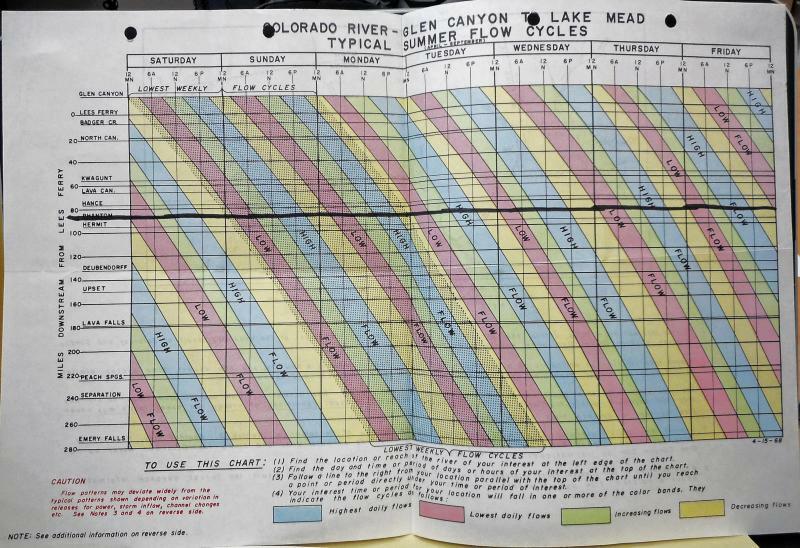 The “hours delay” is reported because dam water releases are frequently lower on Saturdays and even lower on Sundays. The day of the release should be taken into consideration. Reports vary on the “speed” that the tide travels, some report 4.0 mph and others report 5.0 mph. The first table uses time calculations based on 4.0 mph. In these days of low river levels (2007), the 4.0 mph rate may be more accurate. A separate table indicates times for this flow rate. The tide rate can also vary depending on the overall level of flow, “low” water travels slower than “high” water. The bottom line on tides is that you can expect the water to drop out from under your boat in the night from Six Mile to North Canyon, and from Blacktail to Backeddy. Some folks don't worry about it, and just expect they will need to push their boats into the water in the morning if the river has dropped. Here is a tide table from the late 1960's. You can download this public domain image at this link. Our thanks to Jay Meierdierck for creating the tables below. Phantom Ranch is typically referred to as 24 hours after release. Whitmore Camp is typically referred to as 48 hours after release. The following table can be copied into a spreadsheet and be printed on one page. It condenses the data from the above tables. Rise @ The time when the water will start rising at that point in the river. Water will start falling 12 hours later. Note that there are generally reduced releases on weekends, which may not reach you until later in the week. Click here to return to the Campsites page. Click here to return to The Dam page. This page was last edited on 30 March 2019, at 13:33.